There are some amazing, hidden wedding locations around Los Angeles. Jenna and Gabriel introduced me yesterday to Orcutt Ranch in Canoga Park. What a beautiful setting for this offbeat couple! After a short hike through palms, grapefruit trees and towering oaks, we arrived at a 700 year old oak tree and the ceremony commenced. Orcutt Ranch has a lot to offer wedding couples in Los Angeles. Check out their event page to learn all the options! Jenna and Gabriel hired me as their officiant after I answered their ad on craigslist! I coordinated my whole move to Los Angeles using craigslist, and I advertise my wedding officiant services there now, so I appreciated their resourcefulness and wrote them right way. Luckily for me, they thought I was just whom they were looking for! Jenna and Gabriel are a fantastic couple, and their unconventional wedding was a great affair, including Jenna’s attendants breaking out into “Don’t Stop Believing” right before they processed to the oak. Congratulations again! I had a wonderful time as your officiant and filled up at your backyard reception. Cheers to you and your many, many years of happiness together! 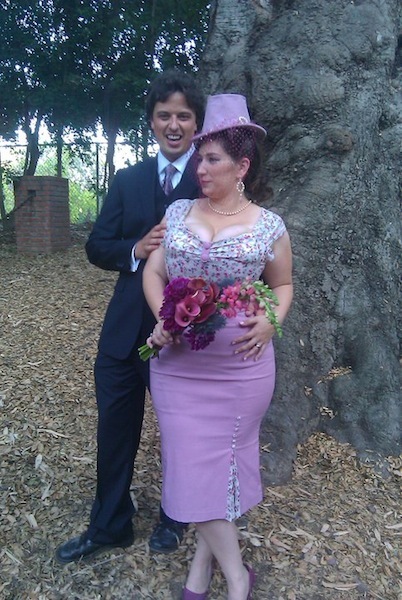 This entry was posted in wedding officiant and tagged Canoga Park, Los Angeles, offbeat, Orcutt Ranch, wedding officiant. Bookmark the permalink.